One of the many benefits of vacationing in a condo is the kitchen. 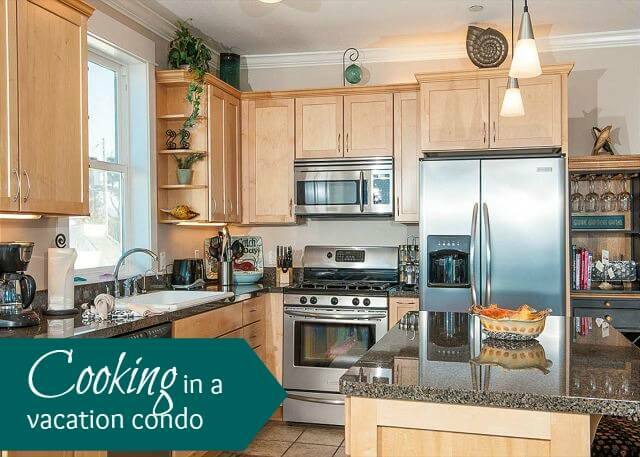 Many of Keystone Vacation Rental’s properties have luxury kitchens complete with stainless steel and granite. At the same time, it is a vacation, and most of us probably don’t want to slave all day in the kitchen. We are compiling a list of our favorite tips on cooking in vacation condos. Check them out on our Pinterest board, Cooking in a Vacation Condo. Bring freezer meals. Do most of the cooking at home, and use the condo kitchen to cook and serve already prepared foods. You can also buy a prepared freezer or refrigerated meals for an easy alternative that is still cheaper than eating out. (We love Costco for these stock-ups, although you’ll need to plan ahead as there isn’t one in Lincoln City.) Want a list of make-at-home foods that are proven to pack well and please the family? This article, from LifeasMom.com, is a great starting point. As a child, I remember my parents taking me to the coast time and time again and out of those many trips one particular beach was always been a top contender for ‘favorite spot on the coast’. It’s name, Fogarty Creek. About a half mile from our Village at North Pointe condos, this cove is perfect for travelers of all ages as it offers sand, surf, a creek and a large rock to climb up. Out of curiosity I did some research about the park and how it got its name. Below is an article written by Niki Price that I thought was informative and shed some light on Fogarty Creek’s history. John J. Fogarty was a distinguished judge, a businessman and a Lincoln County pioneer. He might have liked a county building, a courthouse or even a scholarship to bear his name. Instead, Fogarty has been memorialized by a waterway, and then a state park, at the very spot where he fell, fully clothed, into the creek. That place is Fogarty Creek State Recreation Area, on Hwy. 101 just north of Depoe Bay. A favorite rest stop since the 1950s, this Oregon State Park is carved from a forest of spruce, hemlock, pine and alder, and offers a covered gazebo and wind-sheltered picnic tables. Two paths, one on either side of the creek, lead under the highway to a small ocean cove. In the center is a formation that is commonly called Rabbit Rock, which at high tide provides spouting horns and wave wonders, and at low tide can even be climbed. It’s a playground for wildlife, too. The Oregon Coast Birding Trail marks Fogarty Creek as a good place to spot winter wren, song sparrow, dark-eyed junco, spotted towhee and hairy woodpecker, throughout the year. Migrants include a number of warblers, like the Wilson’s and the hermit. For the past five years, a conveniently open snag on the south side of the cove has been home to a nesting pair of bald eagles. Down in the rocks, in the intertidal zone, wander gulls, sanderlings and black oystercatchers. Beachwalkers, and patrons at the neighboring Surfrider Resort, see harbor seals resting on Rabbit Rock, or seal pups resting on the beach. The cove is popular with anglers casting for surf perch, and for rockhounds, searching the gravelly beds for agates. During minus tides, the mudstone beds to the north become beautifully sculpted tidepools that give way to mussels, starfish, limpets and anemones (the next set of very low tides will begin around 4 p.m. Feb. 15). And then there are the derelict picnic tables, which some ambitious folks lugged to the beach but apparently forgot to drag back. Today, one lies tilted in the creek along with the drift logs. It has all the necessary amenities, except one: the bronze plaque, or even the painted sign, that tells the steady stream of visitors about John J. Fogarty. He was born in Ireland, in 1852. After the death of his father, the young John and his mother immigrated to the United States. He lived in Indiana, Ohio and California before settling in Oregon in 1884. Fogarty purchased a tract of land in South Beach, near the present location of the Newport Municipal Airport. From 1906 to 1910, he served on the Lincoln County Commission, and later served as a judge of the circuit court. Fogarty died in 1923, but left behind several children. His ancestors are still listed in the Lincoln County phone book, and some may even live on Fogarty Street, in Newport. According to “Pioneer History of North Lincoln County,” compiled by the North Lincoln Pioneer and Historical Association in 1951, the waterway between Lincoln Beach and Depoe Bay was originally known as Salmon Creek. Then again, perhaps a plaque could wait. Another version of the story, told much later in a magazine, says Judge Fogarty fell off his horse into the water. One more, graciously located for the TODAY by Anne Hall, director of the North Lincoln County Historical Museum, has evidence that the judge was looking for a place to build a cabin, rather than a bridge. But the jist is the same. “He was wearing his best clothes at the time, and according to his son, his friends and neighbors thought it was funny and never let him forget it. That’s why they began calling the creek ‘Fogarty Creek,’” Hall wrote last week. There’s yet another story, found among references as respected as “Oregon Geographic Names,” that contends it was not the judge, but his son (also called John, but who was generally called Jack Fogarty, or Captain Jack) who made the splash. Sounds like the plaque might have to wait. But maybe it’s a fitting lineage for a place that is so full of fun. When we asked the Oregon Coast TODAY Facebook community for input, they responded with stories of weddings, picnics and family vacations. One reader reminded us that the beach picnic and football scene in “Sometimes a Great Notion” was filmed there in 1969. Tamara Merry had a memorable first date at Fogarty Creek, more than 20 years ago. They were looking at the waves, feeling romantic, when a hail storm suddenly erupted. “We ran as fast as we could for cover, and I slipped and slid all over the little bridge there. I was soaking wet and extremely embarrassed, but hid my embarrassment with laughter. To this day, my wonderful husband of almost 16 years says that’s when he ‘fell’ for me!” And somewhere, from out in the ether of coastal history, Judge Fogarty chuckled. Thanksgiving kicks off one of the most celebrated holiday seasons of the year. Year after year many families travel to the Oregon Coast to visit family, see friends or just unwind and relax. For those who will be making the trip or the families that may be still be giving it some thought, here are some activities you may be interested in. Community Tree Lighting Celebration (November 29th) at the Lincoln City Cultural Center. Lighted tree, choir music, refreshments, make-and-take ornaments and a visit from Santa! Whale of a Christmas in Depoe Bay (December 7th) – Amidst festive decorations and carolers, the Depoe Bay Christmas tree is lit. Join us for this truly magical event. Keystone Vacation Rentals hopes everyone has a wonderful Thanksgiving! Looking for a special restaurant for a holiday, birthday or romantic dinner? The Blackfish Cafe features fresh seafood and rotates seasonally to use the freshest ingredients. Owner and chef Rob Pounding is a Certified Executive Chef who has won numerous awards and prepared a dinner at the prestigious James Beard House in New York. Be sure to check out our list of other great Lincoln City Restaurants on Pinterest, as well as other great things to do and see on the Central Oregon coast.